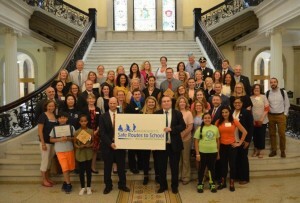 MassDOT, through the Massachusetts Safe Routes to School (SRTS) Program, celebrated the successes of SRTS partner schools and community champions at the Massachusetts State House. Over 100 award recipients were recognized at yesterday’s ceremony across four award categories. In addition, thirteen awards were given to recipients for their exemplary efforts in promoting safe routes initiatives.